I work in a typical corporation. There are large numbers of good people in a beehive of activity and communication. Engineering, operations, and project types are well-educated and trained in the corporate culture. Most come from sixteen years of education, which prepared them for the tasks. They can read complicated literature, follow directions, and get work done. Here’s a recent quote from our local paper about an external audit regarding a failure attributed to communication. Communication among well-educated people is obviously a shortcoming. There is good reason: these educated engineers and managers were taught how to read words and understand definitions, but they have no knowledge of how to read people, find meaning, or hear one another’s hearts. Just beneath the surface, most of these people feel… unheard, unappreciated, unknown and untapped. Hide and seek – Remember playing this game with 2 and 3-year olds? They don’t do a very good job of hiding, because they want to be found. When we say, “I see you,” they respond by saying, “Here I am.” At some level, we are not sophisticated corporate engineers and managers. We are little boys and girls looking for love and hoping to be found. Most have hearts and minds which are not aligned, and most have no awareness of what is in their hearts or that they even have heart. It’s an all-mental, left-brained culture of people who can pass tests and perform tasks! Our institutions are all generally programmed to produce left-brained servants trained to do one thing, who have all the relational and creative energy of an ox. 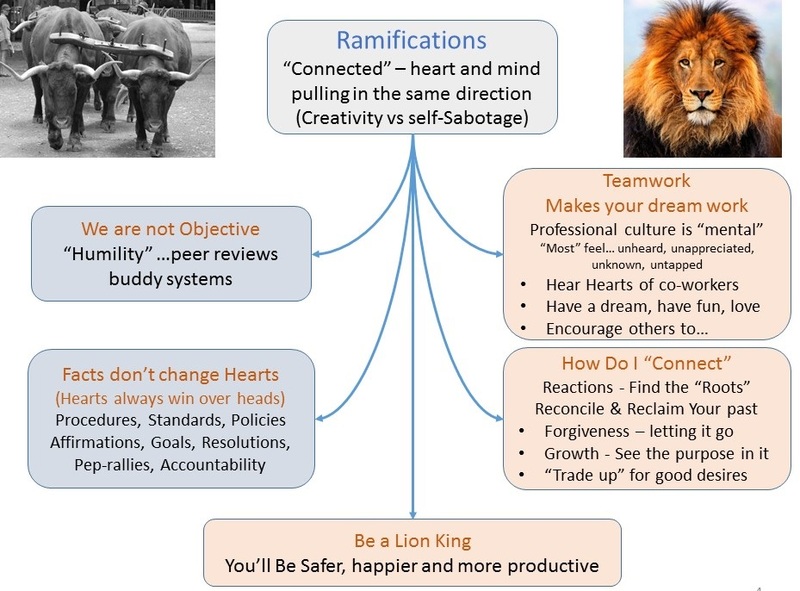 The right-brain Lion King is not present because corporate culture has no value for the “soft skills” of the heart. To be creative, fulfilled and able to release the hearts of others is simply not a priority in a herd of oxen… Plenty of Martha’s, very few Mary’s. Genius – The result is that genius is the exception, not the rule, in all of our culture. Our value on left-brain skills has taken the heart out of our people at the price of creativity, productivity, motivation and love. Corporate culture is literally “heartless.” The unbelievable reality is that when people do connect with their hearts there is genius in every one of us. Ramifications of heart – There are several consequences to this Ox/Lion dilemma. 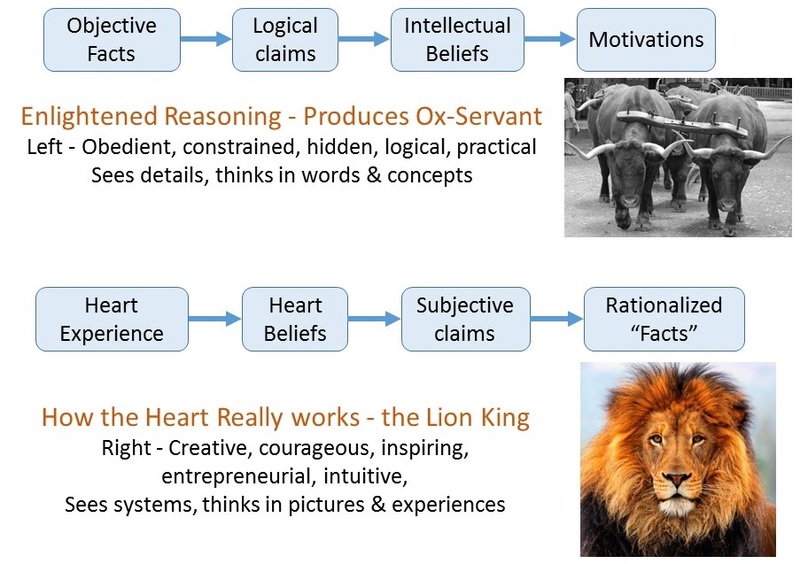 The main objective is connecting with our hearts so that our Ox brain can be put to good use. If we don’t connect, then our hearts can actually work against us in the form of self-sabotage. We are not objective – We make decisions at a heart level, whether we’re connected or not. Humans are never objective computers who make rational decisions. We make decisions from the heart, and justify them with our minds. Enlightened reasoning is a false paradigm that produces left-brained oxen. As such, we are wise to take advantage of peer reviews and input from others. Facts don’t change hearts – The second fallacy of enlightened reasoning is the belief that people change by learning new facts. Everything we believe, say and do originates in our hearts. Heart influences are just starting to be understood in fields like political psychology and marketing / branding because of market realities. The Education and Church Mountains still have no clue. Mothers get it in the Family Mountain (dads, not so much). People in the Arts and Entertainment Mountain do get it. We can learn much from them. It’s easy to hear the difference… “experience” the release of heart in this video by, Darlene Zschech. Teamwork – Every mountain needs Lion Kings who will exemplify the life style of hearing the hearts of others. We must have a dream… have fun, make money and love people… live our lives in way that puts the Kingdom first. It’s our privilege to share this gospel of the Kingdom. It’s like a cup of cold water to thirsty hearts in the desert of our corporate culture. How do I “Connect”? – Our irrational reactions to people or circumstances have roots in the beliefs of our hearts. Heart beliefs cannot be changed by goals, resolutions, accountability or motivational seminars. They can only be “traded” for something better in our Kingdom destiny… by seeing God’s hand in our history. Forgiveness is letting things go so that I can be free. Growth can come if I can find a redemptive purpose behind the suffering. Healing can come when I’m thankful that God brought me through it. Hearts have to have a good reason to change, and an experience to go with it. When change does come, we usually can’t explain it with our minds because there is a miraculous or prophetic ingredient that goes beyond mental explanation. Bottom line – We are Lion Kings when we connect with our hearts. The paradox is that once we accept who we really are and walk in our own greatness, we can then allow our ox to serve others and make them successful. Our hearts guide both: the lion to genius, and the ox to service. The reality is that our right-brain (heart) has to lead and tell the ox (mind) how to serve. Oxen make great dictators, but heartless leaders. Our intellect is a valuable tool that serves a very important function… but who we really are is a matter of the heart.